Did you make a New Year’s resolution? The start of a new year is often a time of reflection where we reassess our lives, identify areas in which we can improve, and resolve to do so. If you’re like most of us, some of the commitments made on January 1 have already flown out the window (did someone say chocolate? Don’t mind if I do…) but if you’re still hoping to make some improvements in the way you work this year, the feedback from an internal engagement program we ran towards the end of last year might just give you some inspiration. 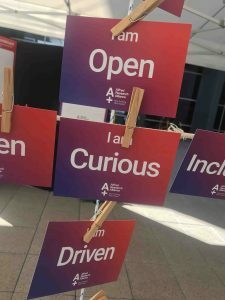 When the Alfred Medical Research and Education Precinct (AMREP) officially became the Alfred Research Alliance at the end of September 2018, we worked with our community engagement partners at the Conversation Caravan to ask the people who work and study at the Alfred precinct their views. Over four days, we had conversations with almost 400 people about their values and the way they could positively influence their workplace and build better relationships with co-workers in their own organisation and with colleagues across the precinct. The answers from the Alliance community were fascinating (Curious came out on top, if you’re wondering – perhaps not surprising in a leading medical research and education precinct!) and the conversations sparked of some very serious commitments by individuals to working more collaboratively within their own organisations, and with colleagues from across the precinct – which is exactly what the Alfred Research Alliance is all about. Want to know more? You can read more about their responses and ideas on the Conversation Caravan blog here – or watch this space to see how these commitments help build the Alliance in 2019…and beyond!